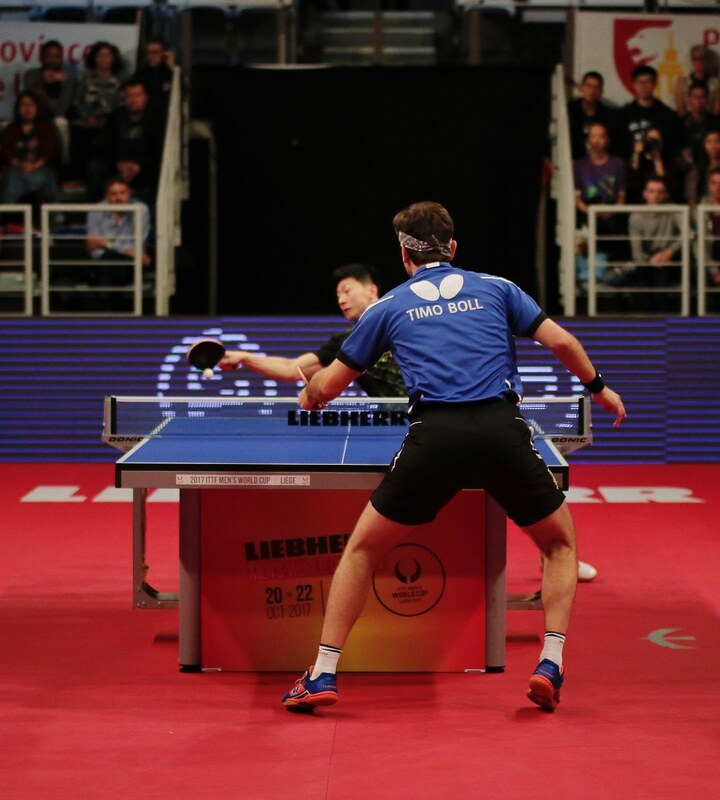 A full distance seven games success for Germany’s Timo Boll at the semi-final stage of the Liebherr 2017 Men’s World Cup in Liège, Belgium on the morning of Sunday 22nd October, when against the odds, he beat China’s Ma Long; immediately after, compatriot Dimitrij Ovtcharov followed suit in an almost equally dramatic duel. Timo Boll, the no.3 seed, overcame Ma Long the top seed, by the minimal two point margin in the deciding game (6-11, 9-11, 11-9, 9-11, 11-7, 11-5, 12-10); Dimitrij Ovtcharov, the no.2 seed, accounted for Frenchman, Simon Gauzy, the no.7 seed, in a contest that also required nerves of steel (6-11, 11-2, 11-8, 10-12, 7-11, 11-4, 11-8). One day earlier against Russia’s Alexander Shibaev, in the deciding seventh game of their quarter-final duel, Dimitrij Ovtcharov had surrendered just one point as he progressed from 2-5 in arrears to 10-6 ahead. Against Simon Gauzy, in the seventh game it was not too dissimilar. He established a 4-3 lead, then won the next four points to lead 8-4, before moving ahead 9-6; however, Dimitrij Ovtcharov was not to run away with the game as against the Russian. Simon Gauzy to his great credit responded. He reduced the deficit to one point at 9-8 but was never able to gain parity, nor win another point; for the first time in his career Dimitrij Ovtcharov had booked his place in the final of the Men’s World Cup. Notably, it was in Liège when Dimitrij Ovtcharov had made his first appearance, he reached the quarter-finals, the round in which he was to depart in the next three editions as well as in 2014 on home soil in Düsseldorf. Last year in Saarbrücken, it was not the best of fortunes falling in the opening round but in 2013 in Verviers and two years later in Halmstad, the end result was much better, he suffered semi-final defeats but finished proceedings in the bronze medal position. Now in 2017 it is new heights for Dimitrij Ovtcharov and it is the same for Simon Gauzy. In 2015 in Halmstad, on debut, he was beaten in round one, last year in Saarbrücken, he reached the quarter-final stage; this year the semi-finals. So logically with present progress should he not win in 2019?